The society of “Spanish Researchers in the United Kingdom” or “Comunidad de Científicos Españoles en el Reino Unido” (SRUK/CERU) was officially established in June 2012 to promote networking within the community of Spanish researchers working in the United Kingdom. 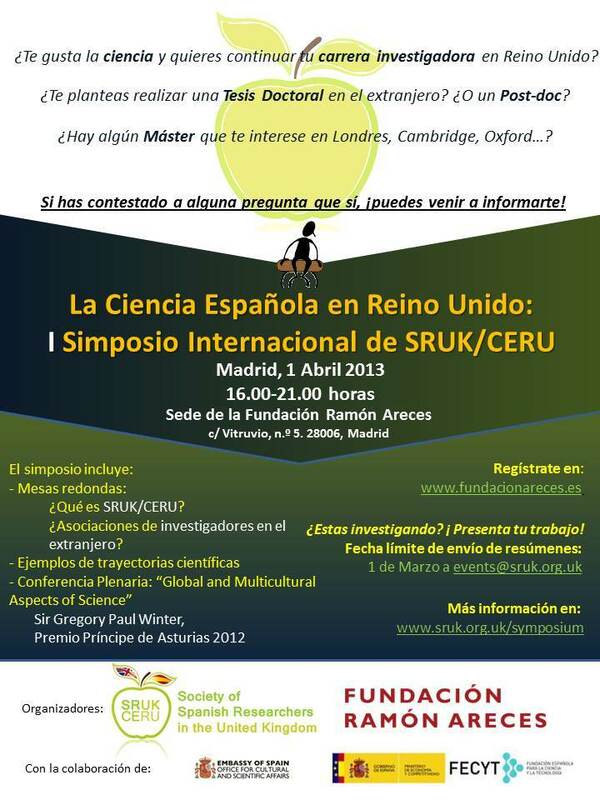 The SRUK/CERU seeks to disseminate science, facilitate scientific exchange and enhance the interaction and collaboration amongst Spanish researchers in the United Kingdom and the Spanish and English research institutions and universities. The SRUK/CERU was created with the initiative and support of the Office for Cultural and Scientific Affairs from the Embassy of Spain in London. The Ramón Areces Foundation and the Spanish Foundation for the Science and Technology (FECYT) has supported the society since its establishment and both finance the celebration of “Spanish Science in the United Kingdom: “1st International Symposium SRUK/CERU-Ramón Areces Foundation”. In this event, we wish to introduce SRUK/CERU to the broad Spanish society, and in particular those with an interest in the scientific community. We would like not only to show our aims, recent achievements and future initiatives, but also to provide a forum for our members to talk about their work, experiences and scientific careers in the UK. In addition, and as part of our goal of promoting inter-centre collaboration and scientific exchange, we would like to invite any researcher (independently of their affiliation to SRUK/CERU) to present and discuss their findings within this international setting by submitting their work for poster presentation. The programme will include four awarded presentations selected from our members and a poster session where everyone is invited to present their work. The posters and presentations will be divided into four different areas: Biomedicine; Environmental sciences; Physics, Chemistry and Exact sciences; and Social sciences/Humanities. On top of these presentations, two roundtables will serve as the framework to introduce SRUK/CERU, its objectives and History, and debate about the role and activities of this society and other similar associations across Europe, such as “Spanish Researchers in the Federal Republic of Germany” (CERFA/SFBD) and the “Portuguese Association for Researchers and Students in the United Kingdom” (PARSUK). We hope this event will be a reference for the future and serve as a platform for new research lines and collaborative projects to be developed, as well as providing a forum for scientific debate at the highest level. The Symposium day is here.